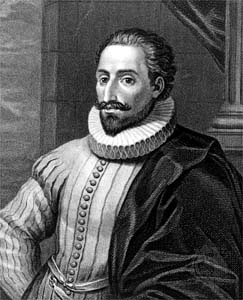 A thirty six-strong team of Spanish researchers comprising historians, archeologists and anthropologists may have located the remains of Miguel de Cervantes, author of Don Quijote and founder, among others, of the modern European novel, in a convent in Madrid where excavations have been taking place since 24 January last year. According to Spanish sources, the archaeological team working in the crypt of the convent of Las Trinitarias, in Madrid, uncovered on 23 February the remains of between ten and twelve adults and five children among which, they were able to speculate with some confidence by 11 March, are those of Cervantes and his wife Catalina de Salazar. Cervantes’s remains were transferred to the location in question in 1673, over fifty years after his death. This hypothesis is based on compelling circumstantial and scholarly evidence that nonetheless remains to be confirmed by DNA and other scientific tests. The discovery is timely: Cervantes died in 1616, so next year will mark the 400th anniversary of his death – an anniversary the Spanish author shares with Shakespeare. Plans are under way to incorporate due acknowledgement of this momentous occasion at the British Comparative Literature Association’s 14th Triennial Conference, which will be held at the University of Wolverhampton in July 2016. The conference will explore the theme of ‘Salvage’. Look out for updates and the launch of the conference website on these pages in the coming months. This entry was posted in Conferences, News, Uncategorized and tagged BCLA, Cervantes, comparative literature, conference. Bookmark the permalink.